For each of our relationships—from the brief interaction with the barista to our bonds with lifelong partners or family members—reflect back to us our predominant state of consciousness. 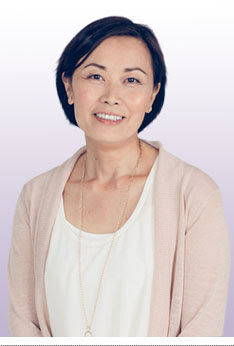 Question: Do you regard psychotherapy or counseling as useful? The essential factor in therapy is the state of consciousness of the therapist, regardless of the modality that the therapist is using. One would think that a psychotherapy such as Jungian has much more of a spiritual dimension to it than Freudian, for example. To some extent that’s true, but the actual method or modality used is really secondary. The primary factor is the state of consciousness of the therapist. In this message we are giving you another sound meditation called“A Stream from the Higher Worlds.” The purpose of this sonic ally is to assist you to purify deeply held psycho-spiritual as well as emotional negativity and toxicity. We hold within the highest realms of our being, which includes theAethos—the non-dual realms of our collective realization—and within the realms of our deepest hearts that this action will benefit you and all living beings upon your planet. It is not, however, just the biological expression of the feminine that is so devalued and in some cases outwardly attacked. The internal and psychological expressions of the feminine are also suspect in our current patriarchal worldview. By this I am referring to the feminine part of our human psychology, which Carl Jung referred to as theanima. The anima (internal feminine) dwells in both women and men, just as the internal male, or animus, also lives in every man and woman. These are dynamic forces that affect our choice-makingas humans in very real ways. Returning to the sound meditation, A Stream from the Higher Worldsis a subtle weaving of potent energetics for personal purification and healing, but it is also for the human collective when engaged with that purpose in mind. You are receiving this email because you opted in at our Web site or asked to be added to the list via email or at a workshop. Copyright (C) 2016 Tom Kenyon All rights reserved. Eckhart Tolle’s simple steps to transcend your struggles – try this tonight! Hi,Do you ever notice that the big challenges you face in your life always seem to crop up when you’re already over-scheduled, time-starved, and distracted by a seemingly never-ending list of to-dos and responsibilities?And that in the midst of that stress, it can be pretty hard to access a peaceful, centered state of mind, which is exactly what we all need to help us deal effectively with a challenge?Wouldn’t you like to discover how to easily slip into (and stay in!) a calm, clear, and grounded state of being so you can easily and effortlessly overcome any challenge you face? Two of the world’s most sought-after spiritual teachers, Deepak Chopra and Eckhart Tolle agree that the first step to raising your consciousness so that you can transcend any struggle – big or small – is to simply practice finding presence in every moment. Focusing on this moment right now prevents the mind from drifting to wants, needs, fears, anxieties, and all of the other suffering caused by the ego-mind in search of attachment. Most of us don’t know how to break challenging life experiences down into the present moment, but everyone can learn. In fact, there’s a short exercise from Eckhart Tolle in this very email that will get you started. Think of a to-do on your list. Something that’s tedious or seems trivial is ideal . . . like washing your hands or walking the dog. It could be something you usually do unconsciously, just going through the motions to get it over with . . . like packing your kids’ lunches or mowing the lawn. Decide to do it fully. Doing something fully means giving it your full attention and doing it happily. By never doing anything unwillingly, you become internally aligned with the external activity instead of there being a conflict. Engage all your senses. Smell the grass you’re cutting, feel the wind blow against you as you go, see the trees around you, listen to the lawnmower. It may not feel natural or make sense to you at first. But it will become second nature. And the more you bring those present moments into your life, the more your old conditioning (your tendency to worry, to become anxious, to feel depressed, or to engage in unhealthy behaviors) is released. Practicing present moment awareness with simple items on your to-do list or small challenges in your everyday life retrains your mind and better prepares you to deal with problems of any size and nature. So eventually you can transcend them with ease. Mastering the art of breaking down life into the present moment is just one important step in raising your level of consciousness to transcend any struggle that arises in your life or in the world – and let that struggle bring you to a greater understanding of who you are and why you’re really here. If you want to continue to develop these new habits and raise your level of consciousness to transcend any struggle with ease – The Chopra Center’s newest online course, Awakening to Higher Consciousness: Deepak Chopra and Eckhart Tolle Answer Life’s Biggest Questions,led by spiritual masters, Deepak Chopra and Eckhart Tolle, will help you do it. Discover the Most Effective Way to Experience Peace, Power, and Presence in the Midst of Any Struggle. The 4-week online course Awakening to Higher Consciousness starts in just three weeks on Thursday, September 15th. We hope you’ll join us! We hope by now you’ve listened to the Chopra Center’s newest online seminar, Beautiful Chaos: How to Find Meaning in a Messy World, where two of the world’s most sought-after spiritual teachers, Deepak Chopra and Eckhart Tolle, reveal the simple shifts everyone can take to find and sustain your sense of peace, power, and presence no matter the circumstances of your life . . . and maintain it even in a world filled with a seemingly never-ending news cycle of problems, disasters, pain, and suffering. Access the Beautiful Chaos recording here at no charge. During the seminar, we made the exciting announcement that Deepak and Eckhart have teamed up to offer a brand-new, 4-week, online course Awakening to Higher Consciousness: Deepak Chopra and Eckhart Tolle Answer Life’s Biggest Questions. If you want to to raise your level of consciousness to transcend any struggle that arises in your life or in the world – and let that struggle bring you to a greater understanding of who you are and why you’re really here – the Chopra Center’s all-new Awakening to Higher Consciousness course will help you do it. It begins in just five weeks, on Thursday, September 15th. Get all the details about the course here. The process of raising your consciousness that Deepak and Eckhart will personally lead you through during this course will allow you to transcend any struggle with ease. With a deep understanding that your problems (and the problems of the world) aren’t random – they’re present because a larger purpose is trying to unfold through you. Able to raise your level of consciousness – and clearly see that your life is not just a random series of events happening to you, but an intelligent force happeningfor you. “Listening to Deepak was a profound experience that helped me let go of a painful event that had been blocking my emotions for most of my life. Now I am moving on with a much clearer sense of who I am and what I really want.” –Terry R.
„Tolle describes ancient truths and applies them to life in the 21st century in a way that is both comforting and empowering.“ –MaryAnn R.
“I’ve gained so much clarity and feel so well-equipped for my next 40 years of life! 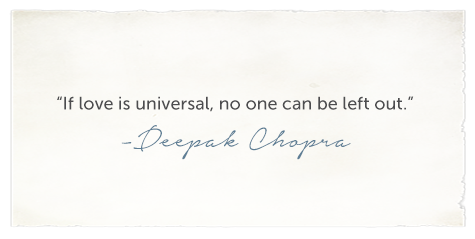 I am the happiest that I’ve ever been and am so grateful for Deepak and the Chopra Center.” –Jane P.
Discover how to raise your level of consciousness to transcend any struggle with ease. Unprecedented access to rare live footage from “An Evening With Deepak Chopra and Eckhart Tolle” hosted in February 2016 at the Shrine Auditorium in Los Angeles. 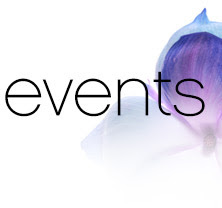 Exclusive access to reflection video content by Eckhart Tolle and Deepak Chopra. 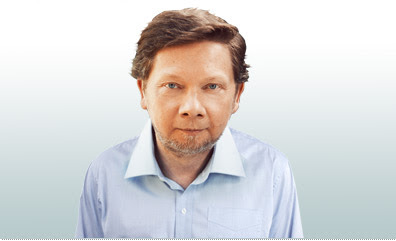 Exclusive access to 3 LIVE Q&A calls with Eckhart Tolle or Deepak Chopra. Access to a private discussion forum, moderated by a Chopra Center-certified instructor, so you can share your experience, ask questions and receive support from others sharing the journey. Lifetime access to your course materials, containing more than 20 video and audio lessons from Deepak Chopra and Eckhart Tolle. Access to a private online journal. 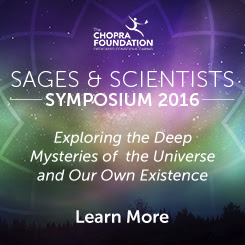 Access to a special meditation, guided by Deepak Chopra, as a conclusion to the course. 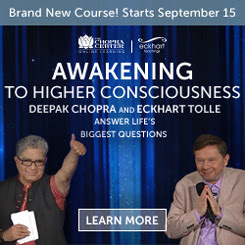 The Chopra Center’s 4-week, online Awakening to Higher Consciousness led by world-renowned spiritual teachers, Deepak Chopra and Eckhart Tolle, starts in just five weeks on Thursday, September 15th. We hope you’ll join us! P.S. When you register by Midnight Pacific Time on Tuesday, August 16th, you’ll receiveThe Art of Creating a Happy and Joy-Filled Life Bonus Bundle, including three powerful resources to support you in expanding your awareness and creating the meaningful, satisfying life you are meant to have. Panache Desai’s „Letting Your Essential Nature Shine“ audio lecture, a 3-month subscription to Deepak Chopra’s Internet television series “One World” Newswire.FM, and paid tuition to Deepak Chopra’s Discovering Ayurveda digital course, offering a combined value of $149, will be yours at no extra charge when you register. Find out all about The Art of Creating a Happy and Joy-Filled Life Bonus Bundle and the all-new Awakening to Higher Consciousness course right here. We come to you today to talk about an important subject. It is the understanding of your true power and the changing of your perception. We understand that this process has been difficult and many of you have toiled on for years. What you must know deep within your being is that there is no longer anything holding you back from achieving the peace within yourself that you so desperately crave. It is you who must now change all that you have come to know and believe. The awakening process is not an easy one as each of you have had to come to the realization that life was not what it seemed. It is as if you have come out of a fog to realize that all is not what you believed. You looked around at your world and mourned for the people, the animals, and the earth. You were shocked to discover that mankind has gone so far out of balance that money controls all. You were shocked to learn that your food, air and water have been tampered with by the very people that you believed would protect you. You have mourned and raged and even become fearful. You desperately have wanted change and often feel mislead because you are unable to see the change reflected in the outer world. It has left you feeling helpless and miserable. These emotions are part of the process, but ones that must be left behind now. It is time for each of you to reclaim your sovereignty, your power, your creation. Each of you are able to hold more light than you ever have before. This is an important distinction because this light from source that illuminates your being is your power. Understand that this light from source is your soul. You are not separate from source, you never have been and it was only the illusion that led you to believe so. This illusion has served you well, your soul was able to participate in learning that cannot be achieved anywhere else in the mulitverse. Many of you have spent countless lifetimes on earth submerged in the veil of forgetfulness, exploring all the aspects of duality and all of what you are and what you are not. You have learned well from these experiences. That time has now come to an end, it is now time to come back home within yourself. The work that you have done to clear out the negativity and veils has created space for your light, your soul, to reside ever more fully within you. It is important for you to realize the deep changes that have taken place within you. Now it is time to take full responsibility for the light you now hold. It is now in your reach to completely change the hologram that you have created. You can now shift all things around you by merely shining your light onto whatever is in your view. Instead of railing against what you fell you can not change, instead now see all things in their highest potential light and allow them to change in reaction. The things and people in your life that are unable to rise up to the highest possible light in which you hold them will move from your field until they are ready to do so. However, many will rise to the occasion and begin their own transformations. When you freely extend your light to all without judgement or expectation you provide space for miracles to occur. There are many stories of mystics and healers throughout your world that have performed miraculous healings. It is not that these beings healed another, it is that they saw each person as whole and healed and this alone allowed for the miracles to take place. Each of you have this ability. It is simply unconditional love in action. See all as the perfect example of themselves and see how much changes within them and in your reality as a whole. Through this process you learned how important your thoughts are on your reality. It is not each individual thought that changes the frequency in which you create your reality, but the predominate emotions created by your thoughts. It is for this reason, that we have talked so much about the need to have joy in your life. The word joy to so many is an unobtainable concept. Yet, we ask you to look at your life and times in which you have laughed, relaxed, been in awe, or even felt simple contentment. This is joy. When you break it down into moments, you will find that you have indeed felt joy many times in your life and in those moments you experienced a shift within. This shift is you moving into a frequency that brings more joyous occasions to you like a magnet. You are powerful beyond measure but it is you who must believe you are so. It is you who can shift all that is taking place in your life by simply focusing on what brings you joy. Each of your contributions are needed within the collective. Each of you that stands empowered will help to alter the course for all. It is time to be the master of your own reality. Me: When you were talking about fact that there is nothing standing in our way of walking fully empowered, all I pictured was an elephant held in place by a chain. The chain was used when the elephant was a small baby and was too little to break free. Even though the elephant grew, it didn’t realize that the chain couldn’t hold it anymore and didn’t resist. Quan Yin: Yes the elephant was conditioned to believe it was powerless to change its fate. This can be likened to the human who through the veils of forgetfulness was conditioned to believe that they were powerless to change their direct reality. It is this conditioning we are asking all to see through. Me: I have a client who goes into a grocery store and sees the fruits and vegetables as whole and perfect, blesses them, and with her intention knows that the will be healthy to those who eat them regardless of organic/nonorganic and gmo/non gmo. Quan Yin: That is it exactly. It is understanding that you can alter the frequency of all, your foods, your water, and your air and those around you just by simply holding them in the highest light. The more light you are able to hold within your being, the higher of frequency you will be able to transmute. Me: The concept of being joy is a hard one. When I was first awakening I was so anxious, scared, angry and felt powerless. I couldn’t get how people could run around as if nothing was wrong. I even found myself begrudging football fans as being asleep fools. Didn’t they understand that the sky was falling? What I have come to understand now is those football fans were enjoying themselves. They were gathering with friends and celebrating life while it was I who was negative and unhappy. In those moments of fun, it was they who were holding more light. Watching the Olympics now I can see how much my thoughts have shifted. I see the competitors as people experiencing this life just as they wanted too and in their own way are breaking limits. Quan Yin: (laughing) It is quite a change isn’t it? You see you are now able to honor each person’s path, each person’s contribution and are seeing that it is perfect for them. With the ability to experience many lives and realities why wouldn’t you choose to experience all that you can? It is important for each person to see what definitions and restrictions they have placed around the term joy. I prefer to think of Joy as the state of being present, open and in awe. Me: The vasovagal nerve is being activated for many right now. They are experiencing headaches, neck aches, heart palpitations and stomach aches. I understand that this also correlates to the Well of Dreams Chakra at the back of the head. Quan Yin: Your entire brain is being changed by the energies. No longer will you be left of right brained but you will have the ability to access all parts. This also correlates with the Divine masculine and feminine. These too will come into balance within each person. As the chakra at the base of your skull is activated it will allow for greater access to the unseen realms. As this opens, it also may release pent up fears and anxiety may be increased until it is fully balanced and functional. Me: What can people do to alleviate this anxiety? Quan Yin: Observe what is coming up and see where the cause lies. For some things you will be called to action, to change what brings forth the fearful reaction. For others you will find that they are irrational and have little to do with your present situation. Maintaining present focus and assessing your current situation in each moment will help you to realize that most anxiety is created by projecting into a reality that does not exist yet. This is why breathing is essential to move through anxiety. It allows you to be present in the body and helps alter your perspective. Join me at this year’s Celebrate Your Life featuring powerful life changing workshops with myself and other top spiritual visionaries. This is a gathering like no other! Best of all, the conference will be ground zero for a massive synchronized meditation with millions of people from around the world focusing love and light on the upcoming election for US President. Celebrate Your Life is committed to creating a safe and nurturing space for YOU to experience the most transformational, healing and sacred “aha” moments that will stay with you for a lifetime. This is your chance to let your hair down, peel away the layers and let your soul shine through. People travel from all over the world to attend Celebrate Your Life! . . .and so much more! Many of your favorite spiritual authors will be at this conference and will join in the worldwide meditation for the US election including Gregg Braden, Carolyn Myss, Marianne Williamson, Neale Donald Walsch and many more. James Twyman will be leading a massive meditation from the Celebrate Your Life conference where MILLIONS of people will join in a single intention – to bring about the HIGHEST GOOD in the Presidential election that will happen only a few days later. Do you want to be part of HISTORY? Keep opening these emails and we’ll tell you exactly what time the meditation will be and how you can be involved. We need your support, and if you’re at the actual conference, then you’ll be at GROUND ZERO! 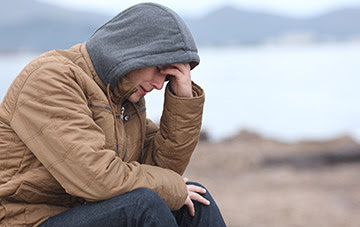 Inner turmoil—including feelings of worry, agitation, anxiety, and depression—can be a great source of pain and suffering, leaving you feeling helpless. The best strategy to escaping inner turmoil is to support your mind in what it wants to do in the first place, which is to be calm. Here’s how. While most of us would not volunteer to experience physical pain, it can teach us valuable lessons. Here are five practices that can help reduce the suffering that comes with physical pain. Ready to try your first yoga class? If you’re intimidated by the thought of moving your practice out of your living room and into the yoga studio, here’s a guide for what to expect. Conflict is part of human nature. Gaining a sense for how people best respond during difficult conversations will help minimize communication breakdowns. Follow this guide to the steps: compromise, negotiate, mediate. If you are struggling with meditating mindfully, try this simple exercise that engages the mind with sound and the body with movement. Knowing that happiness is a choice means if you aren’t quite as happy as you want to be, you can make changes. Try implementing these six daily habits to increase your sense of joy and peace. Trying to better yourself has value, but only when you do it with love and compassion. Learn how to stop being your own worst critic. to the Chopra Center Newsletter.